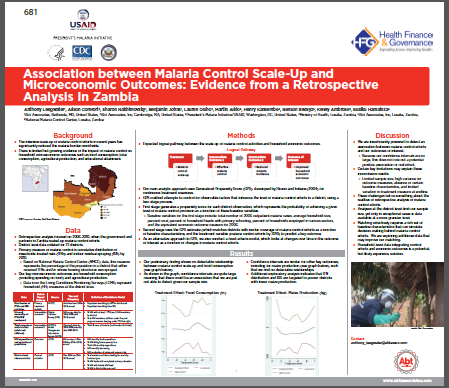 An HFG study assessing the associations between malaria control scale-up and micro-economic indicators in Zambia, where significant progress has been made in scaling up effective malaria control strategies, was presented at the 2015 Annual Meeting of the American Society of Tropical Medicine and Hygiene. Using data from 2006 to 2010 on the distribution of insecticide-treated nets (ITNs) and indoor residual spraying (IRS), the study examines whether the scale-up of these activities in Zambia is associated with improved micro-economic outcomes at the household level. Specifically, do these activities affect household spending on food, household spending on medical care, schooling attendance, agricultural production, and household savings and borrowing? Particularly in a context of limited resources, the results of the study will inform policymakers, donors, and development practitioners on the returns to investing in malaria control by considering the micro-economic benefits of these strategies. To answer these questions, the study used secondary data collected by multiple Zambian ministries and the National Malaria Control Center (NMCC) to conduct retrospective, multivariate analyses to match districts at baseline in 2006. HFG researchers then compared micro-economic outcomes of nearly 20,000 households at endline in 2010, as a function of malaria control activities conducted during that year and preceding years. The study is expected to be published in a peer-reviewed journal by the conclusion of 2016.